It is a time of great tension in the Catholic Church. People are asking questions that people never used to ask. It seems as if the men in charge cannot keep up with the pace of change, and a widely-read national magazine puts the crisis on the front cover. The story inside explores “The Catholic Exodus,” and explores the difficulties American parishes are having staffing schools and churches with priests and nuns. You can be forgiven if you think this is a story from 2011. But it is, in fact, from 40 years earlier. Indeed, it is easy to believe the crisis in the Catholic Church in the U.S. is a fairly recent thing. But in some ways, the debate that is going on now is an extension of debates that have their roots in the 1960s. This came to mind last week when I read about the death of a 95 year-old nun named Anita Caspary. Her name is no longer a household one, but it was her’s on the cover of Time when the magazine explored the Catholic crisis decades ago. In the end, some 300 nuns initiated a series of changes in day-to-day life that they thought were in the spirit of the times. Cardinal McIntyre, whose mother was born in Kiltormer, Co. Galway, disagreed. When all was said and done, the nuns parted ways with the church. Some see it as one of the largest breakaways in Catholic American history. The trouble between the cardinals and the nun has its roots in the changes wrought by the reforms which came out of the Second Vatican Council. Spellman had attended the meetings in Rome and feared liberal forces had hijacked the proceedings. Spellman, whose Irish grandparents had settled in Massachusetts, was named sixth archbishop on New York in early 1939. Later, he would also be named Apostolic Vicar for the U.S. Armed Forces, a key position with World War II looming on the horizon. Since Spellman had to serve New York and the military, he relied heavily on an auxiliary bishop – James Francis McIntyre. In the late 1940s, McIntyre went west to become the second Archbishop of Los Angeles. The area’s population boom made McIntyre an influential figure. 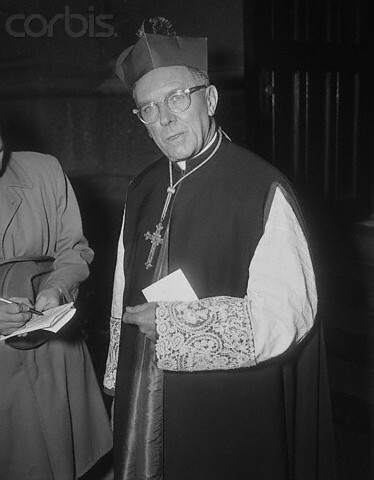 When the impact of Vatican II became clear, McIntyre and Spellman were seen as opponents. The Los Angeles-based Sisters of the Immaculate Heart, however, believed that the time was right to propose a series of changes -- nuns would no longer need to wear habits, or follow traditional Vatican guidelines when it came to prayer and even reading material. The sisters believed they were doing what a good Catholic does -- following the rules that were coming out of the Vatican. But McIntyre did not accept the nuns’ proposals. If they moved ahead with their changes they would not be allowed to teach in Catholic schools. “All these changes were taking place without incident in the majority of dioceses around the country. Cardinal McIntyre simply was saying, ‘Not in my diocese,’” Sandra M. Schneiders, a professor emeritus at the Jesuit School of Theology, told The New York Times this week. The 300 nuns eventually formed a communal Christian organization that served the poor and elderly and still has over 150 members. So, while the times are rough these days for American Catholics, maybe they’ve been that way for a long time.